I hope everyone has a wonderful Christmas and you have lots of laughs and get the biggest smiles when people open the presents you've given them. And for those of you who don't celebrate Christmas... hey, it's a day off school, right? Oh, and Skulduggery was very happy to hear that the Americans kept up their side of the bargain. Nice going, fellas. Oh, you should tweet something on your twitter account! Just something small! (or simple) Like hi.....or hello! Advance hello to nixon strange and the gang! (Im so glad I RSS'd this site, I get updates whenever you post! Shut storm, if I had just checked..
Godammit! I need first on a post. First is a hard thing to get. I'm happy. RSS is the trick. just subscribe. I think this is as close as I've ever gotten. Derek, I know you're there, so are you going to chat? MERRY CHRISTAMAS DEREK LANDY YOU ARE EPICA! YAY! Happy Christmas, everyone! And to you, Derek!! For you are above being put into the same category as 'everyone'. I keep on mixing Darren Shan and Derek Landy up! I talk to darren alot! I'm going to sleep. G'night. I just finished reciting the entire Grinch poem on my front lawn. And he..he himself. The Grinch carved the roast beast. "MAN WALKS DOWN THE STREET IN THAT HAT, PEOPLE KNOW HE AIN'T AFRAID OF ANYTHING." FDALKJEICKEAMLWIOMWI YOU PROBABLY WON'T EVEN SEE THIS BUT MERRY CHRISTMAS. Merry christmas everyone! Although I don't know why you're on here when you could be doing something else. NEVER MIND. P.S I got an iphone! And now, I shall go admire my presents once again. HAVE A GREAT DAY EVERYONE WITH LOTS OF PRESSIES AND FUN TIMES AND OVER-EATING!!! I celebrated it today - Christmas Eve - with part of my family, and then with the rest tomorrow. Two, well, three, Christmases! Yay! Hope you get some decent presents, Derek! 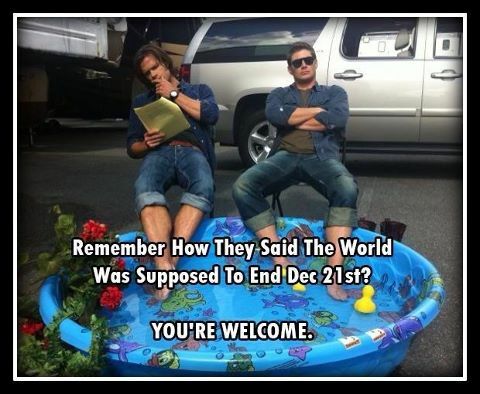 SUPERNATURAL! YEAH! GO DEREK! WOOO! FABI IT RUINED MY CHRISTMAS! I DONT KNOW WHAT TO FEEL! I JUST WANT TO DIEEE!!!! WHY DID THEY HAVE TO PUT IT OUR RIGHT BEFORE CHRISTMAS?!?! Idk, I didn't plan it. Maybe they thought christmas would make y'all feel better after it? NO!! MY CHRISTMASES WILL NEVER BE THE SAME NOW!!!!!!! Ah. Well I have a grudge against December 9 for a similar reason. Except not Merlin. MY LIFE WILL NEVER BE THE SAME!!! ok I'm probably over exaggerating on this... tomorrow I'll probably wake up and be like "Oh Silly me... It wasn't THAT bad..."
WTF AM I SAYING?!??!?!? MY LIFE IS FOREVER CHANGED!!!!!!!! "you really don't see, do you?" Of course your life will never b the same. Ur dead. NO CLEMENTINE!! LEAVE ME DEAD!!! Save us, Cosma? ...Lem? ...Grendaline? ...Tii? ...Someone? Sigh. At least it wasn't a rook attack. Alph? ...Humbaba? ...Spriggan? ...Mab? ...Zille? ...Friendly? ...Please? NO! BAD CLEMENTINE!! NO APPLES FOR YOU! OMG, it was Pot!!! I 4got Pot!!!!! Grins. Frowns. Pot, I'll never 4get u again if u bring back Ur!!!!! Please???? Yay! I've never confused a dead person before. :-p my explanation probably confused you more, srry. Got the expansion pack, or my quarazy explanation?? [continues to rant] I didn't even complete Haraiva!!!! Yay, I'm part of the gang! Thanks, Editor's Article! I'll never be able 2 go 2 Roobrik or Balzare again!!!! HELLO WORLDLY PEOPLE OF BLOGLAND!! Nope, guess you were wrong. I'm just a figment of your imagination, and my own. HI FIGMENT OF MY IMAGINATION THAT SOUNDS JUST LIKE FABI! Skulduggery Pleasant, chapters late 16-17. Jade the disco fairy, Polly the party fun fairy, Amy the amethyst fairy, Bethany the ballet fairy and Chloe the topaz fairy as hollow men. Haha, I usually use Maya the Harp fairy or Riganna the Seahorse fairy. Hey, Jubi! Does it hurt when I battle figments of your imagination?? Polly the party fun fairy also plays Scapegrace and Grace the Glitter fairy is Crux. Brilliant, I know. Yawn. Ima go sleep, you should 2 if you aren't already. Christmas morning, it would appear. Happy Christmas/Yule/holidays of your choice or preference that happen to fall on this day/period, everyone! Merry Christmas, Master Derek, and everyone else too! Merry Christmas everyone!! I can't stop!! Jubi, I haven't watched Merlin yet!! Hope everyone has a great day!!!!! And Merry Christmas Derek, I hope you get better presents for Christmas!! Bye!! Merry Christmas Derek and everyone! No one's staying on today...that's kinda rubbish. Mr Derek of the Landys. COME ONLINE OH LORD AND LET US BASK IN YOUR CHRISTMASSY GLORY. A story for anyone who's bored and alone here. This was just a regular airport, and everything was normal. Wait. Scratch that. There's a woman in passport control arguing because her passport says she is a man named Vaurien Scapegrace. And her boyfriend apparently looks more handsome in his passport photograph then in real life. Wait, that's not a woman. It is Scapegrace. "I know it says I'm a man!" Scapegrace yelled. "I AM A MAN!" "Um, no, you're clearly not. Your boyfriend there, though, is. Still, he doesn't look anything like his passport photo." "HE IS NOT MY BOYFRIEND! AND I AM A MAN!" The security looked at him like he was absolutely crazy. "Sir, we're going to have to put you in jail if you keep insisting that you're male." "Master... I don't actually know if you're male or not," Thrasher gulped. "OF COURSE I AM MALE YOU FOOL!" he screamed, and kicked Thrasher in the shin. Thrasher assumed the fetal position and cried. "Sir, we're going to have to put you in prison," the guard started. "No! No! The Zombie King will not take orders!" "I think it should be the Zombie Queen," Thrasher added helpfully, and Scapegrace pulled him off the floor. Thrasher got in first and, once Scapegrace was seated, started driving at top speed. Scapegrace gave a regal wave to anybody who passed him, and like any good lady wearing a dress, he kept his legs together. Thrasher looked at him. "Ma'am?" "You're wearing a dress. With flowers on it. Pink flowers." "Um... All right... anyway, we're heading for a store. Do you want me to switch directions before we collide?" "No! The shops will part for the Zombie King!" Thrasher whimpered and drove straight into a cafe, knocking everybody over. Scapegrace whispered to Thrasher, "I need to get some makeup on the way, so can you head to Sephora?" Thrasher gave him a horrified look. "I think you're turning female." "No! I'm not! Just because a man wears a pink dress and high heels doesn't make him female!" Thrasher looked at Scapegrace's heels. "Ah. That's why you needed the car to get away from the security." "No! I practice running in heels all the time. See?" Scapegrace hopped out of the car and started running alongside it. That is, until he tripped and fell flat on his face. Thrasher jumped off the car and went to help Scapegrace up. "I'm sorry," he sobbed. "I shouldn't have let you run in heels." Scapegrace looked at him. "Wait, did you turn off the car?" A couple of shrieks gave him his answer, and he looked up to see the car disappearing into the sunset. Technically the airport. Details, details. "Well, if we can't run, we can hide!" Scapegrace shouted, and jumped into a coffee shop. "Act normal!" he told Thrasher. They both sat down at a table. And sat. And sat. And then a guy came up to Scapegrace. "Hello, beautiful. Can I buy you something?" Scapegrace looked at him. "Bring me a cup of coffee, slave." He laughed. "All right then. Is this your boyfriend?" Scapegrace looked at Thrasher. He was sleeping with his mouth wide open, and was slowly sliding down the chair. "Um." And then the man kept on talking to her—HIM, sorry—and would not shut up. And Scapegrace was beginning to feel annoyed. She—HE—kept trying to tell him that he was male, but the guy would just laugh and say something boring. Finally, the man left, but only so he could order Scapegrace's coffee and come back. Scapegrace woke Thrasher up by slapping him. "Thrasher," he said, "I need you to pretend you're my boyfriend so this man will stop bugging me." Thrasher looked at him blankly. "OK." When Scapegrace turned away, he squealed happily. "DON'T TOUCH MY BOYFRIEND!" Thrasher screamed, flailing his arms about, and Scapegrace put his head in his hands. "DON'T TOUCH HIM! GET AWAY FROM HIM! GO! MOVE!" The man gave him a confused look, and Thrasher said, "SEE? HE HATES YOU ENOUGH THAT HE MADE ME HIS BOYFRIEND! SO GO!" The man was completely lost for words, so he settled for walking away. "YOU'D BETTER RUN!" Thrasher shouted, and the man walked faster. "How did I do?" he said. Scapegrace stared at him with his mouth open. "I am going to kill you," he managed to say. If you read the first sentence of Death Bringer to a dictator, it will come out like this: The closing Dynamique can like that watching everything of aghast at the table. Editorsarticle, I'm part of the gang now? I feel so loved! DOCTOR WHO TODAY! THE FIRST EPISODE THAT I WILL WATCH LIVE! By live I mean as it airs, o'course. And I am going now, for it is Christle Mistle! Oh dear....wait...nope I'm good! Doctor Who is on tomorrow, for me...that is. But Derek do you know you are a green egg on twitter? ADMIRE MY NEW PROFILE PICTURE! MADE IT THIS MORNING! WITH MY CHRISTMAS PRESENT, AKA PHOTOSHOP! Admire itttttttttttttttt. Took me hours . . . mostly coz I was figuring out how to use Photoshop at the same time . . .
MERRY CHRISTMAS, GUYS! MERRY CHRISTMAS, DEREK! was anyone else EXEEDINGLY upset by Merlin?? Hey Zaf! I got an iPhone! Would anybody be kind enough to look at my blog? I reccomend fanfics on it. I've decided that I like balloons. Derek Landy, you are awesome, and funny, and amazing, and I can't think of anything else to say right now, and this sentence is too long, and I just realised that I always make sentences this long, and I think my English teacher would have a fit. I'm still getting used to the new keyboard. SPARKY SAYS HELLO AND MERRY CHRISTMAS! Gtg guys snowball fight bbl!!! Waiting for my dad to get home since he's working today. And I have a cardboard cutout of a TARDIS and a David Tennant. And so much more. And a fez. Wow. I love Christmas. And a very merry Christmas to you!...Wish I had the confidence to say more...I HAVE QUESTIONS DAMN IT AND MY BRAIN WON'T LET ME ASK THEM! I got an iPhone for Christmas! I got a lot of books, an iPhone, CD's from musicals, a book of Cats music, a book of Phantom of the Opera music, and a book of some songs from Jekyll and Hyde that didn't get used in the final show. So god help me f i dont shoot trevor he shoting me! Ooh the Jekyll and Hyde thing sounds cool! Can I call you ValMar?